Celebrities - Oprah and Beyonce, to name a few - fawned over Bam and offered to serenade him, give him air time or offer their endorsement. 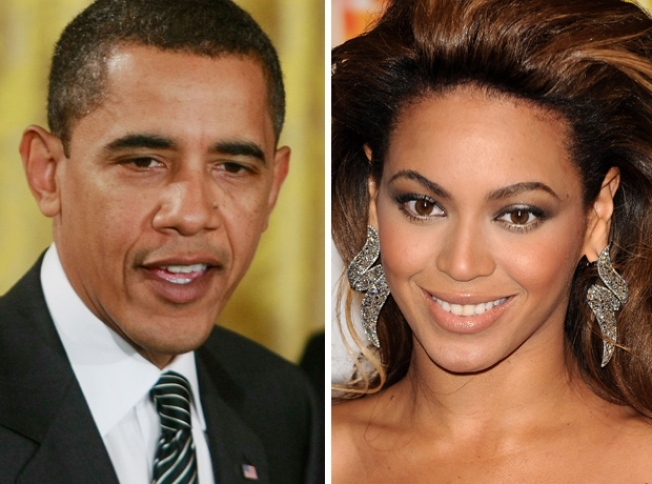 Barack Obama is now the biggest celebrity in the world. The BlackBerry toting President who became the inspiration for lyrics, commemorative tchotchkies, DVDs and facebook sound-offs is not just plugged in to pop culture -- he has redefined it,according to Entertainment Weekly's latest cover issue. "He's bigger than Britney, bigger than Beyonce, bigger even than Brangelina," the magazine proclaimed. "I've never seen a president who's connected with the culture like Obama," David Gergen, adviser to Presidents Nixon, Ford, Reagan and Clinton told EW. "Kennedy had some of that same appeal. But Obama has somehow touched a nerve that we didn't know we had." Roughly one-third of the people on earth watched footage of No. 44 being sworn in last Tuesday and 1.8 million people crammed into the nation's capital to be there in person -- even if they could only catch a glimpse of Bam on one of the dozens of Jumbotrons that dotted the National Mall, the mag reported. "What a presence. Stunning. Just stunning," Sugarland's Jennifer Nettles, who performed at the Lincoln Memorial Concert for Obama, told EW. "People who have such charisma have a higher message, a higher vision. That's the difference between a celebrity who is popular on some level and one [like Obama] who can imbue the rock-star spirit with everybody they come in contact with." Celebrities - Oprah and Beyonce, to name a few - fawned over Bam and offered to serenade him, give him air time or offer their endorsement -- anything to help the unflappably cool. Young voters also feel a connection to the President because he is among the most tech-savvy ever to be in office. Obama's campaign was based largely on an online grassroots effort and now the Prez offers weekly YouTube addresses. "Obama has a great story," screenwriting expert Chris Vogler told EW. "It's very deep and archetypal. It's got all the elements of the mythological hero. The long road of trials he went through -- that's important in mythology." John McCain may have been right - Obama may be the biggest celebrity in the world.